Parking is on site at the hotel. When arriving to the hotel pick a ticket and park in Car Park A. When returning to pick up the car go to the reception with your confirmation to get your ticket validated for exit. Pod is £5 each way to terminal 5 - If flying from another terminal the Heathrow Express can be used for from terminal 5 to the other terminals. Alternatively guest can take bus 423 for free from the hotel to terminal 5 or the Hoppa bus to all terminals. Runway View restaurant, open for breakfast and dinner and Runway View bar and terrace, both with great views. Oak & Avocado Lounge is available for drinks and light snacks all day too. Restaurant open from 6.00AM for breakfast. 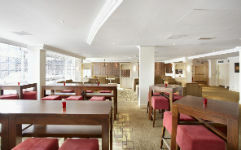 Breakfast is charged at £10 per person for full English breakfast if you buy a voucher on check-in. Adjacent to the hotel is the Spring Health leisure club which is available to guests, with Pool, Gym and Sauna at a charge of £7.95 per person. There is also a hotel gift shop. The Thistle was very handy for a very early flight from Heathrow T5, the Pod parking made it simple. I didn't use any of the hotel's facilities so can't comment but the bed was clean, comfy and I got a good night's sleep. Hotel a little bit tired but still comfortable with good eating and drinking facilities. Perfect for Terminal 5 with easy parking and very fast POD transfer into the terminal. I would always use the Thistle when it's available at a reasonable price - the rate varies hugely. Very helpful and polite staff. Reasonably priced. Small but comfortable room. Very good priced parking package. Free bus right outside hotel to T5 (and T2/3), and Pod to T5. Comfy beds and amenities good for one night. Hotel dated but that's ok for the one night. Bar and restaurant adequate if expensive. Very pleased with all the arrangements made by FHR. The hotel was very adequate for an overnight stay and parking was a real bonus. Staff very he,pful and courteous. If I were to be critical, it would be (1) The price to upgrade to a slighly larger room was far too high (2) Whilst the restaurant was good, adding an automatic 12.5% gratuity is naughty! (3) The toilet in our room was at a funny angle and I fear could be a problem for larger people. Other than that, it worked really well for us. Ideal for our night stop prior to departing T5. Perfect for terminal 5 departures with the hub taking you from the hotel- staff very pleasant and professional- breakfast very good value - was surprised not to hear aircraft noise! Have booked again. 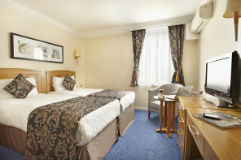 A friendly hotel conveniently situated to Heathrow where you can leave your car for the duration of your holiday (max. 21 days). Parking and hotel good value. Hotel room is ok for one night. Package of one nights accommodation with 21 days parking was ideal for us. We have used this Hotel and package in the past and have always been satisfied with it. Perfect positioned hotel, just a little old and tired. A bargain nights stay including parking. Onsite restaurant surprisingly good with excellent views of the runway! Best thing is proximity to T5 using the Pod!! Very clean and efficient hotel . Near to Terminal 5 with good connecting services to the airport. Great for a stay before an early flight next day. Hotel looks dated from the outside, sales applies to internal decor. However beds are comfortable, nice bar on site and restaurant offers good value meals (particularly breakfast - which is excellent). Staff are friendly and helpful throughout, especially in the restaurant. POD from hotels to T5 is quick and efficient. Everything was absolutely great. We stayed at the Thistle London Heathrow as we were travelling from Terminal 5. A very short walk away to the Pod and 5 minutes later we were at the Terminal. The hotel was fine and the evening meal was good. Everything worked like clockwork, so much so that we have made the same travel arrangements for next March. Booked a package of one night hotel & 15 nights parking, signage to car park A , could have been better, however reception staff were excellent, particularly when they noted our baggage & that we using the POD, they changed our room to ground floor & nearer to the POD access. Room was typical of airport hotel, however beds were very comfortable, pillows especially so. Dinner was OK, but we failed to note the automatically added 12.5% addition to the bill, whilst it is shown on the menu, its in light grey print right at the end of the menu, however upon checkout the duty manger removed it upon request.Breakfast at Â£10 each, was poor value for us as we only had a cereal & tea, thus maybe an option to have continental at a more attractive price could be an option for the management to consider. Room was fine, a bit noisy but that is to be expected that close to Heathrow. Parking good and the POD service to T5 excellent. From the west M4. At junction 5 (A40/ B470) leave the motorway and at the roundabout take the third exit A4, signposted Colnbrook. Travel along the A4 and follow signs for Heathrow and Hounslow. At traffic signals turn right, signposted M25, Heathrow Airport and Staines. After approximately 300 metres, at the next roundabout take the first exit onto the Old Bath road. Travel through Longford village and the hotel will be 250 metres on the right-hand side. From London M4. A the M4, junction 4, take the 1st exit which is signposted Heathrow Terminals 1,2 and 3. At the next roundabout with the Concorde take the second exit signposted Terminal 4. After approximately 30 metres, take the first exit off the roundabout signposted exit Slough A4. At the traffic lights, turn left onto the A4, signposted Staines. Travel along Bath Road and just before McDonalds and the Total petrol station turn left onto Old Bath road. The hotel is located 100 metres on the left-hand side. From M40, M25 Junction 15. At the M40 junction 1A joining the M25 follow signs for Heathrow. Stay on the M25 to junction 15 and join the M4 heading towards Heathrow and London. At junction 4 of the M4 take the third exit right, following signs for Terminals 1,2 and 3. At the next roundabout with the Concorde take the second exit signposted Terminal 4. After approximately 30 metres, take the first exit off the roundabout signposted exit Slough A4. At the traffic lights, turn left onto the A4, signposted Staines. Travel along Bath Road and just before McDonalds and the Total petrol station turn left onto Old Bath road. The hotel is located 100 metres on the left-hand side. If booking a parking package, when arriving to the hotel pick a ticket and park in Car Park A. When returning to pick up the car go to the reception with your confirmation to get your ticket validated for exit. Heathrow POD will take you from the hotel right into terminal 5 (£5 each way) in just 5 minutes. If flying from another terminal the Heathrow Express can be used free of charge from terminal 5 to the other terminals. There are several options for getting to the airport. We'd recommend using the POD, which is connected to the hotel via an outside walkway. The POD takes 5 minutes to get to T5 and costs £5 per person each way. You can buy tickets for the POD shuttle at the hotel reception. You'll get an access code and directions to the POD at the hotel's reception. It leaves every 3 minutes and runs from 3am - 1am on weekdays, from 3am - 11pm on Saturdays and from 4am - 11pm on Sundays. - Use the machine to call the POD - Once you get in, press the button for T5 - You'll arrive at Car Park Level 2, Business Parking and take the lift to Departures. A taxi to T5 will cost around £16 and an MPV Taxi from £23.50. Or you can take the Free Local Bus No: 423 or bus No: 7 from bus stop close to the hotel, from the hotel to terminal 5. On return from T5 to the hotel, Bus No: 423 can be caught from bus stop 6 and Bus No:7 from bus stop 8 at Terminal 5. 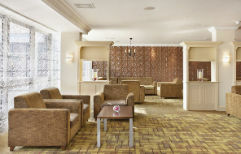 Transfers via the Hotel Hoppa* to T5 are charged at £5 single per adult. Children under 15 travel free (subject to change) if you buy them from the driver. Bus stops outside the hotel reception. HEATHROW HOPPA TRANSFERS: BUS H4 to/from terminals 2 - 3 Transfers via the Hotel Hoppa are charged at £5 single per adult. Children under 15 travel free (subject to change) if you buy them from the driver. The Hoppa* doesn't run to T4. You will need to take the Hoppa to T2 and from there catch the free Heathrow Express to T4. A taxi to T4 will cost around £18 and an MPV Taxi from £23.50. *The 'Hoppa bus' and the POD are services run by third party operators and do not form part of the package purchased and any other information, not part of the package is subject to change without notice.